It may seem out of order to write about Readings from the Book of Exile after promoting events with Pádraig in Melbourne for the last month, but Pádraig is best as a performance poet, so listening to the poems brings them to life in a way that reading perhaps cannot and I now have more to say! Having said that, I still think you should go out and buy this little book, together with a new release of poems which is due out in August called Sorry for your Troubles, which is birthed out of his reconciliation work. the life that she is loving. my love and resurrection dreams. I recently heard Les Murry suggest that there were three elements to poetic communication: daylight consciousness, dreaming, and the body (it’s breath, rhythm and dance). If this is the case, then I can say about myself that I receive a poet’s message through the body first; it is my particular starting point with words. Perhaps that is why I love Pádraig’s words: they have a vibrant rhythm to them that carries me up into the story of the words where I can know whatever it is the story has to teach me with a deep, sensory knowing. The older I get, the more I value reading theology through the poetic form: somehow it is better able to capture the subtlety of things – the fact that we can know God without ever really knowing God. There is a freedom in speaking about God this way, a freedom from the expectation that our words are capable of containment, that God will always be bigger, better and beyond our wildest dreams. 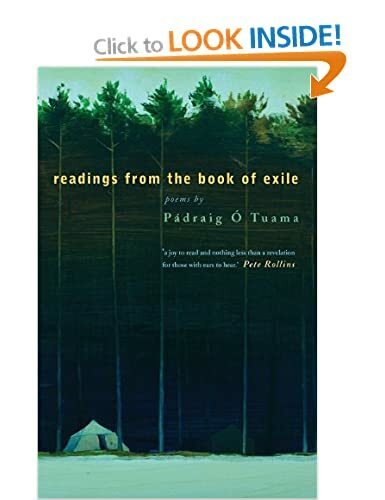 With gratitude then, do I read seven ‘readings from the book of exile’ which form the structure of the book’s corpus, and the many other poems which address faith and the human spirit. I am thankful for my Irish brother Pádraig, for living the life he has been given in order to write these words which now accompany me in mine. The Universe is made of stories, not atoms, Rukeyser said. But it also true that there is not one single story – there are many stories. Stories that overlap each other, stories that contradict each other, stories in harmony and stories in disharmony. This afternoon and evening will explore the power of storytelling for the heart, for faith, for protest and for living. We will tell true stories with each other, as well as reflect on the primal need to story ourselves and to story our identities in order to make sense of our disordered word. Pádraig Ó Tuama works as a poet, theologian and community peace worker in the north of Ireland. In particular, he uses poetry and storytelling to help groups of people with different experiences of politics, religion and identity to create a space of understanding, sharing and creative diversity. Apologies to my international readers, but I’m about to post a series of really wonderful events to come along to in Melbourne. Pádraig Ó Tuama is a delightful Irish poet in Melbourne for three months doing a stint as poet-in-residence for the Uniting Church. I am involved in promoting a couple of public events which promise to be very special. Pádraig is a poet, justice activist and theologian from Belfast. He has a beautiful way of seeing the world, and an even more beautiful way of speaking about it. I’ve set up a wordpress site as a conduit for a number of his public events that are being organised by various groups around Melbourne, which he is squeezing into an already full program working with various Uniting Church staff and volunteers. Go check it out and get along to whatever you can!